The original Carnegie Library building’s second story featured two large wings, one of which served as a lecture hall. Today the north wing serves a similar purpose, while the opposite wing has been converted to executive office space. The lecture hall and the activities hosted within contributed to the Carnegie Library earning a reputation as an esteemed house of learning. Exhibits in the library lecture spaces ranged from art displays to natural history. 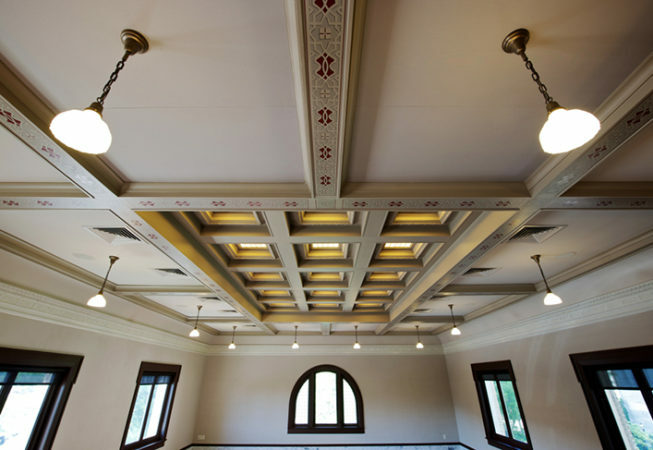 Many historical details were incorporated into the restoration of the north lecture hall. Coffered art glass skylights were refurbished and backlit to recreate the original effect of the Kansas sunlight streaming through. Remnants of ornate stenciling were discovered on the ceiling during the demolition phase of the renovation and were compared to historic photos. This enabled lead artisan Robert Elliot from Art Effects LLC to recreate the details by hand. 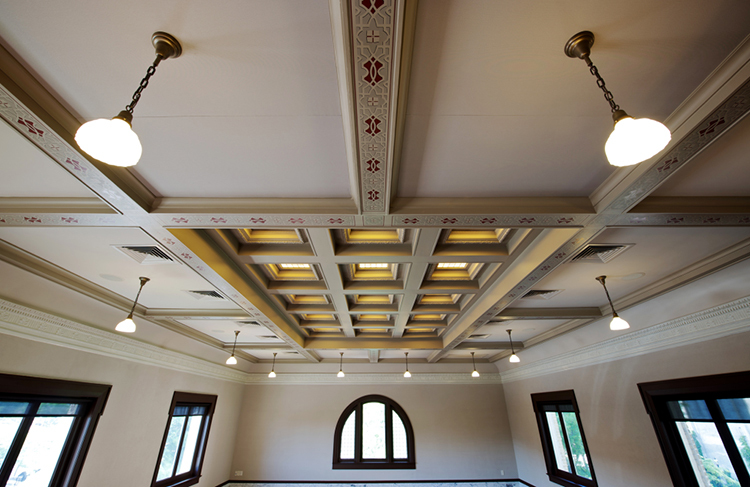 Today, the room still embodies the educational spirit of its original use. The renovated lecture hall has been used for art shows and Fidelity Bank employee training sessions. Modern audio visual equipment has been added.